The weather here, like much of the country right now, is hot. Our hottest temps so far, I do believe, this summer. Mid 90’s all week with no sign of rain in the forecast. The local pool is closed until next year with kids back in school. Although .. many this week are on early release due to the fact there is no air conditioning in their classrooms. A pool would be nice. Here on the acreage .. Lengthy Morning Meeting Around the Water Cooler ..
.. the herd seems to be weathering it all just fine. Other than, rightfully so, they’re thirsty. 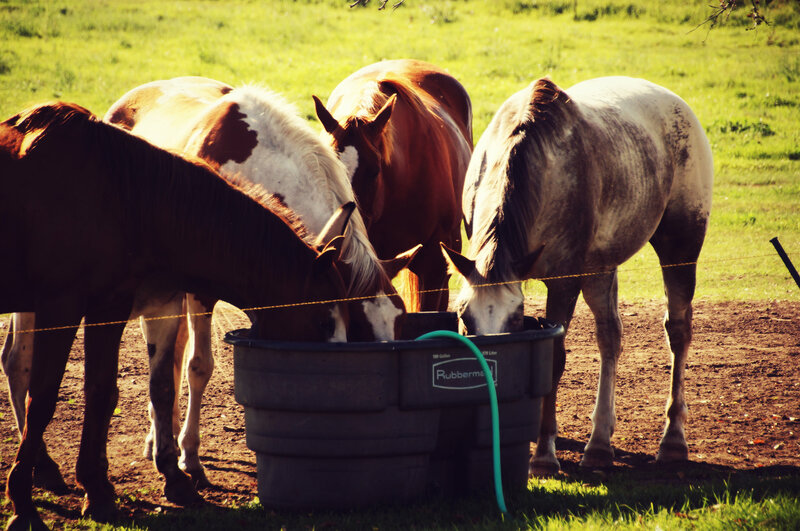 One indication of just how thirsty – these 5 seldom if ever make room for each other at the trough. I had to grab this shot this morning because this is a rare sight. This entry was posted in Cowboy, Horses, South Dakota, Summer heat, Uncategorized, Water Cooler and tagged Horses, School closings, Staying hydrated, Summer heat, Water cooler by Carleen Wild. Bookmark the permalink.